From the town of Kamuela on the Big Island of Hawaii’s Big Island Brewhaus & Tako Taco Taqueria comes their “The Red Sea of Cacao” an Imperial Red Ale. This beer is a collaboration between Big Island Brewhaus and Caldera Brewing Company out of Ashland Oregon. 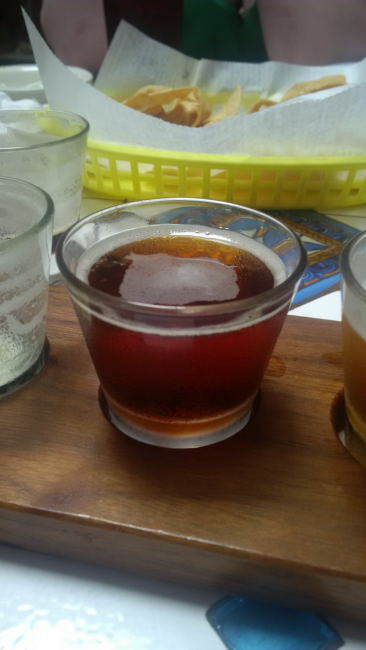 The beer pours a reddish copper colour with an off white head. The aroma consists of sweet caramel, chocolate, fruits and sea salt. The flavour is of caramel, chocolate, molasses, malts, fruits, sea salt and pepper. There is some alcohol warmth to finish this beer off. The alcohol content comes in at a big 8.6% with an IBU of 30. This is a very weird beer in a very good way! This was a very well made beer. This entry was posted in Imperial, Red Ale and tagged beer, big island, big island brewhaus, cacao, Caldera brewing company, caramel, chocolate, collaboration, fruit, fruits, hawaii, imperial, imperial red ale, malt, malts, malty, molasses, pepper, peppercorn, red ale, salt, sea salt. You head over to Hawaii often? Or are these available locally for you? Just got back from Hawaii last week. Lots of reviews to write. Their beer is only available in the State of Hawaii and not much makes it off the Big Island yet. Only been bottling for 6 months. Bombers only. Thought so, it comes from a brewpub, right? It used to just be a Mexican restaurant called Tako Taco Taqueria but then around three years ago they opened the brewery side. They then renamed it Big Island Brewhaus & Tako Taco Taqueria. On the bombers it’s just Big Island Brewhaus. So it is a brewpub but not normal pub food. Children are welcome there also.